Hi Everyfurry!! It’s Cookie the foster kitten here! I have been enjoying living here at Casa Furry Bambino with my sister Caramel. At first Caramel and I stayed in our apartment upstairs, but now we are free to roam about the house. Apparently, this postion is known as “The Full Monty”, so I will enter this photo in Monty Q’s contest. In other news, I am a little bit worried. Apparently, Mommy likes to (gasp!) eat cookies! And she likes to eat caramel, too! She has never tried to nibble us, but I am still a bit nervous. 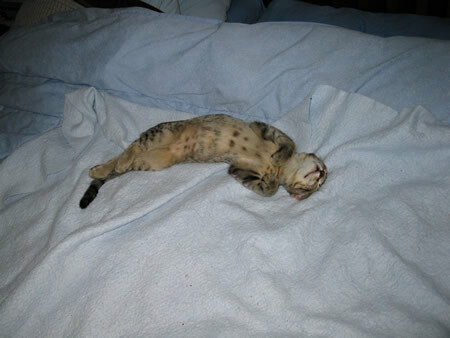 Filed by Fosters on Aug 2nd, 2009 under Fosters, Full Monty, Nap Action, Nervous. 8 Purrs or Hisses.